Looking for a real food version of frosting? 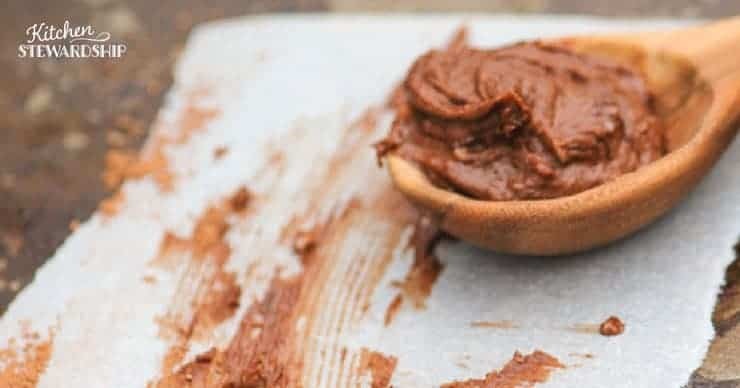 Made with healthy fats, this chocolate or almond frosting tastes great, is easy to make and pipes easily. You can even color it naturally for fun cake decorations. My husband was always the kind of person who ate the cake out from under the frosting at weddings, and he always requests a birthday cake with no frosting, just plain white (boxed mix) cake, please, and since it’s his special day, everyone else can add the frosting on their piece as they wish. As the kid who would grab for the extra frosting rosettes, even though they always ended up too sweet, I couldn’t really understand his point of view. When we were shopping wedding cakes, he graciously deferred to me rather than request an unfrosted cake (can you imagine??). So this post is sort of good news and bad news. Good news? My mother’s homemade frosting recipe was the first one my husband ever liked. Bad news? It’s still frosting, and a sugary one at that…so maybe it would have been better if he just never liked it! But just for special occasions. And yes, it’s still chocolate. 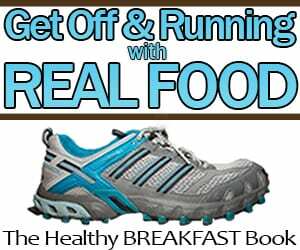 That’s why I posted on how chocolate might even be healthy – and when it crosses the line out of real food! Combine powdered sugar and egg in mixing bowl with a fork (a mixer works too). You will think it will never work, that there’s no way all that powdered sugar could possibly be incorporated into the one egg, but just keep mixing. Do not give into temptation to add another egg. It will work! Combine water, granulated sugar and salt in a small saucepan. Stir over medium heat until the sugar is dissolved. Add slowly to the egg mixture while beating with an electric mixer, until fully incorporated. This mixture will look a little like really thick, sticky/gooey pancake batter. Add the fat, cocoa, and optional extract. Spread on the cake or chill for a half hour to make it easier to pipe designs. Keep leftovers in the refrigerator for longer storage or at room temperature if on the cake. 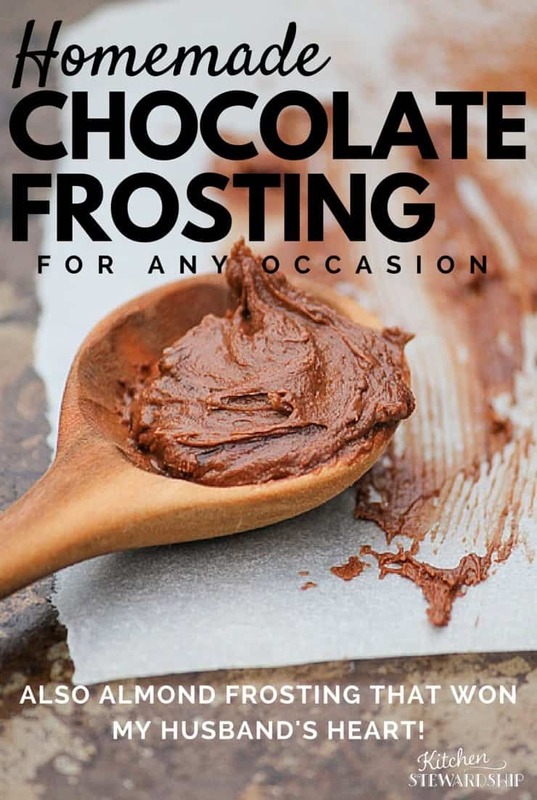 You can also use coconut oil, but only if you’re going to refrigerate the frosting since the melt point is 76 degrees. I tried it once in the wintertime, and it worked out great. Get this recipe on Plan to Eat HERE! At least it has lots of butter, right? I try to use Wholesome Sweeteners powdered organic cane sugar to make it slightly better. Or you can take sucanat and whiz it in a blender to make unrefined powdered sugar, too. The chocolate would cover up the different color. 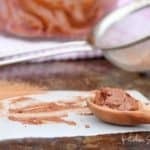 If you would rather have a homemade frosting with natural sweeteners and some nutritional value beyond the butter and egg, using this healthy probiotic frosting is a great option, as is homemade whipped cream, made from real cream, which almost won’t even need the bit of honey or maple syrup and vanilla that you could add. Or try Bethany’s lazy whipped cream in a pinch! If you’re not into chocolate or just want something different try the almond version. This is my mom’s famous frosting. It works so well for birthday cakes. Plus you can use natural food coloring to perfect your decorations! 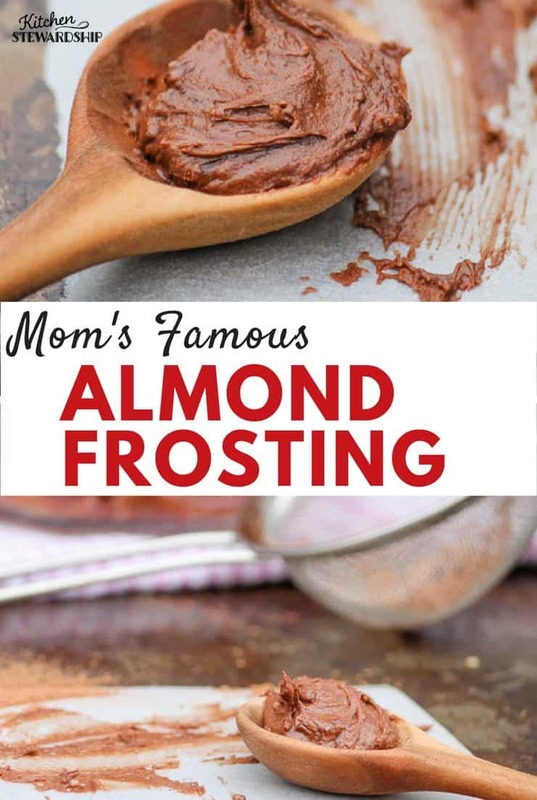 A simple, homemade almond frosting perfect for any cake or cookie. Add slowly to the egg mixture while beating with an electric mixer, until fully incorporated. Add the butter and extract. You can also substitute vanilla extract for the almond, but it’s the almond flavor that makes it special for me. Want peanut butter frosting? Use natural peanut butter in place of the fat. This may make the frosting too stiff, but you can add hot water a tiny bit at a time until you reach the desired consistency. My brother has had a banana cake with peanut butter frosting every birthday since he was born, and it’s so yummy. I’m sure it would also make a chocolate cake something special! The almond-flavored frosting is also great on sugar cookies, and we love the leftovers on graham crackers. Just so you don’t have to beg for the homemade graham cracker recipe it’s here. Did I mention this is my family’s ultimate favorite frosting? It is as good as it looks, and so are these whole grain cake recipes I use. Are you a frosting or cake person? Chocolate or almond? Or just plain vanilla? « Previous Post Can I Eat Dark Chocolate if I’m Trying to be Healthy? This looks yummy. I heard of a trick for softening butter when you forget to set it out: pound it flat with a rolling pin (or roll it) and beat if for a minute and it’s ready to go. 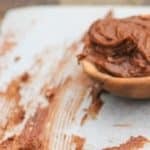 I always make homemade frosting by just mashing together butter and powdered sugar, plus cocoa powder or vanilla or another flavoring extract, until the consistency is right. 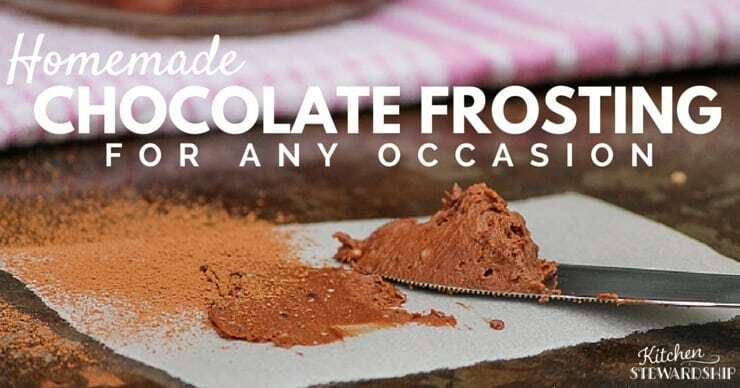 It’s MUCH easier than cooked frosting and tastes great. It’s quite popular with my 11-year-old’s friends because it’s so much yummier than supermarket frosting. For carrot cake, substitute cream cheese for at least half of the butter. My other frosting recipe, perhaps more accurately called “icing” or “glaze”, is equally simple: powdered sugar + lemon or orange juice. Don’t add chocolate or extracts to this one; the juice gives it enough flavor. It can be made thick for spreading with a butter knife on cookies, or made thin and drizzled on top of a cake. I’d love to have a healthier substitute for powdered sugar–and I’d love to get my son to accept white frosting or have a healthier alternative to food coloring–but we only make 2-3 frosted cakes and 1-2 batches of frosted cookies per year, so it’s not a big deal. I’m more worried about the supermarket frosting (and attached cake) that my son ends up eating at friends’ parties and when other people bring cake for church events. My partner’s birthday cake is always a Blueberry Streusel Coffee Cake, which has no frosting and lots of fruit but is absolutely scrumptious! I make my frosting the same way, Becca. Just powdered sugar and butter. You can make your own powdered sugar by blending cane sugar in a high speed blender. That is what I always do. You can use a natural sweetener and avoid the added cornstarch. I’m glad someone asked about the raw egg. Eases my mind. Can you leave out the chocolate to make a vanilla frosting? Never seen frosting with egg before. Thanks for posting! Would coconut oil work in place of the butter? That is all I have on hand.